While good things like wisdom and achievements come with old age, there are also those that some of us wish to never experience. This is especially true for noticeable skin and body changes that can give away your age. As the years add up, your skin might feel drier and less elastic with the appearance of fine lines and wrinkles. The good news is you are not completely powerless over these visible changes. With the right lifestyle, skin care products and treatments, you can prevent aging skin and take some years off your appearance. Sun exposure is mostly to blame for the majority of visible skin aging. You can protect your skin by using a broad-spectrum sunscreen with an SPF of 30 or higher. Dr. Sylvia Skin Care from Cutis Laser Clinics in Singapore provides two light and oil-free mineral sunscreens that you’ll love wearing. Both Clear Defense SPF 45 and Sheer Defense Tinted SPF 46 provide Broad-Spectrum protection that are suitable for all skin types and can protect you from UVA, UVB, and Infrared rays. Avoid eating food high in sugar and carbohydrates as they can speed up aging skin due to glycation, the attachment of sugar to our protein molecules (collagen) wherein it produces advanced glycation endproducts (AGEs). These AGEs are harmful to our collagen and once we accumulated a lot, it damages our collagen rapidly making our skin more prone to lines and wrinkles. Drinking too much alcohol also has a similar aging effect, as it dehydrates and damages the skin. Try eating more foods that are great antioxidants such as tomatoes, blueberry and strawberry. You may also add more protein in your diet such as lean meats, fish, beans, and legumes. Foods high in vitamin C such as oranges, broccoli, cauliflower and green peppers are also beneficial in keeping the skin youthful. Smoking dramatically accelerates aging and appearance of wrinkles. As it deprives your skin of oxygen and nutrients, you are likely to notice sagging skin, poor skin tone, and fine lines around the lips. Quitting can do a lot of wonders for your skin and overall health. If you already have wrinkles and dark spots due to the habit, you can consider non-invasive aesthetic laser skin resurfacing treatments. Cutera Pearl Procedure from Cutis Laser Clinics in Singapore uses FDA-cleared laser resurfacing is ideal for improving skin texture, removing brown spots as well as minimizing the appearance of fine lines around the eyes and mouth. Anti-aging serums are designed to target specific skin concerns such as fine lines, age spots, and sagging skin. What makes them so effective is that they contain the most potent dose of anti-aging ingredients, including antioxidants, skin brighteners, and peptides. This is great for your morning and evening routine. Dr. Sylvia Ramirez of Cutis Laser Clinics offers Fibroblast Growth Factor Serum, which targets age related break down by reactivating dermal and collagen activity. This dynamic anti-aging serum also improves skin density, texture, and firmness. Another face serum that provides your skin with tons of benefit is Vitamin C 20% with Ferulic Acid. This antioxidant serum has free radical fighting properties that protects your skin from harmful UV rays and helps you achieve healthy skin with a youthful appearance. Vitamin C 20% also provides additional hydration and skin lightening benefits. Use it every morning for additional sun protection. What sets chemical peels apart from a regular facial is that it peels the superficial layer of the skin to reveal a smoother and younger looking skin. You can try the Cutis Crystal Peel, which can lighten age spots, freckles, discoloration, and uneven skin tone. If you’re looking for a stronger peel, try VI Peel, a chemical peel treatment from the US. It uses medical-grade ingredients such as Salicylic Acid, Phenol and Vitamin C to exfoliate the skin and remove blemishes on the skin surface causing it to peel for at least a week. After a chemical peel treatment, sensitivity to the sun may increase. It is best to limit sun exposure or protect your skin by wearing protective clothing or slathering on sunscreen SPF when going outdoors. 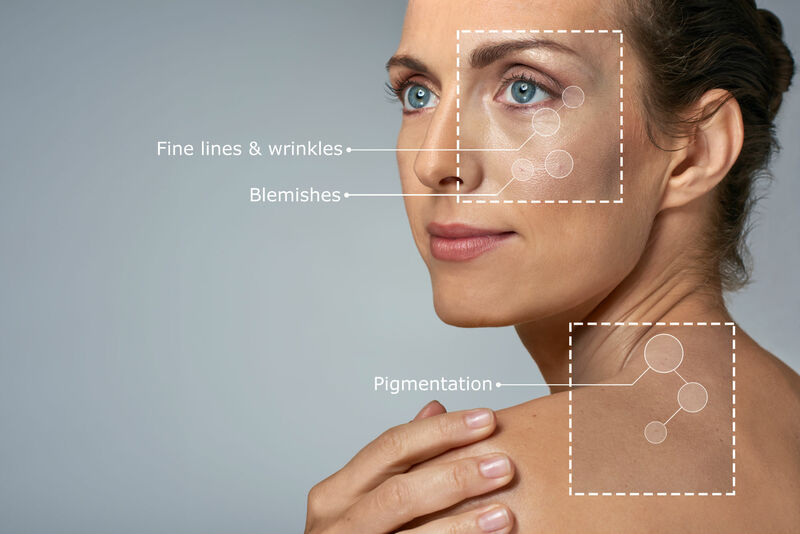 Limelight is an FDA-cleared anti-aging treatment that uses intelligent pulses of light (IPL) to treat a range of skin issues such as age spots, redness, and tiny veins. It works by drawing out brown spots to the skin surface causing them to scab and fall off after three to five days. It can be used on any part of the face, neck and décolleté areas. Laser Genesis, on the other hand, is an FDA approved treatment that uses a specialized laser handpiece to warm the top layers of the skin. It stimulates collagen growth while also reducing wrinkles and skin redness and minimizing enlarged pores. When combined, these two can treat wide a range of common skin issues. The use of a light-based procedure along with a laser-based one can help address problems right at the surface of the skin such as sun damage, fine lines, freckles, and mottled complexion. When properly used by an experienced aesthetic doctor, Botox provides very natural and refreshed look. It works by temporarily blocking the signal from nerves to muscles, which then softens and relaxes wrinkles formed by muscle contraction. The treatment only takes a few minutes and there is no downtime needed. Be sure to avoid strenuous exercise after the treatment for 24 hours. You should also avoid manipulation (like massages) of the treated areas for 3 to 4 hours after the session. This is to avoid the spread of Botox in muscle areas where it should not migrate. Dermal fillers, on the other hand, are best for “filling in” or replacing lost skin volume due to aging. These are typically made of hyaluronic acid, which is a type of molecule present in the skin. Fillers can help reduce facial lines, improve eye bags, and restore naturally curved facial contour, giving you a rested and a more youthful look. In Cutis Laser Clinics in Singapore, we use Juvederm fillers which can also be used to recreate cheekbones, enhance your profile, sharpen the nose, and offer a subtle lip enhancement. Mild swelling or soreness can occur on the treatment area after one to two days. There may also be temporary bruising, which can be reduced by using cold compresses immediately after the injection. Both Botox and dermal fillers should be only administered by a skilled injector to provide optimal results and minimize the risk of other rare complications. While you cannot stop the aging process, but there are a lot of things you can do to delay the signs of aging. Schedule a consultation with our Harvard-trained aesthetic doctor in Singapore, Dr. Sylvia Ramirez, to know which products and procedures work best for your skin concerns.